You must be a registered user in order to view this page. T4 DNA ligase requires a 5’ phosphate on one of the DNA molecules to be ligated in order to join DNA, for this reason it is often necessary to phosphorylate DNA molecule prior to adding it to ligation, for example when blunt cloning a PCR product. Incubate the kinase reaction(s) for 30 minutes at 37 degrees C.
The phosphorylated PCR product can then be used directly in a ligation reaction without clean-up (for example when performing site-directed mutagenesis). If the PCR product is to be ligated into a de-phosphorylated vector, heat-inactivating the PNK enzyme may be a good idea to prevent it from phosphorylating the backbone vector and leading to high background. This is achieved by incubating the reaction(s) for 20 minutes at 65 degrees C.
when making a DNA library, the process of shearing DNA often leaves ragged ends which must be blunted first before they can be cloned into a vector. In a situation when choosing compatible restriction sites is impossible requiring the vector and insert, or both, to be blunted before ligation (may be a last resort). There are two options, either use a DNA polymerase (like Klenow or T4) or Mung bean nuclease. Klenow and T4 DNA polymerases both fill-in 5’ overhangs and chew back 3’ overhangs. If you need to fill in a 5’ overhang either enzyme will be fine but if you need to remove a 3’ overhang then T4 may be a better choice as it has a stronger 3’ to 5’ exonuclease activity. Mung bean nuclease chews back both 5’ and 3’ overhangs. DNA should be dissolved in 1x restriction digest buffer (for example, NEBuffers 1-4) or T4 DNA Ligase Reaction Buffer supplemented with 33 µM each dNTP [final concentration]. Add 1 unit of Klenow per microgram of DNA and incubate for 15 minutes at 25°C. Stop the reaction by adding EDTA to a final concentration of 10mM and then heating at 75°C for 20 minutes. DNA should be dissolved in 1x restriction digest buffer (for example, NEBuffers 1-4) & supplemented with 100 µM dNTPs [final]. Add 1 unit T4 DNA Polymerase per microgram DNA and incubate for 15 minutes at 12°C. Stop the reaction by adding EDTA to a final concentration of 10 mM and heating to 75°C for 20 minutes. Suspend DNA (0.1 µg/µl) in 1X Mung Bean Nuclease Buffer or a restriction enzyme buffer (for example, 1X NEBuffer 1, 2 or 4). Add 1.0 unit of Mung Bean Nuclease per µg DNA. Incubate at 30°C for 30 minutes. DO NOT attempt to heat inactivate Mung bean nuclease because single stranded regions of DNA may appear before the enzyme is inactivated resulting in unintended degradation. Inactivate the enzyme by spin column purification or by phenol/chloroform extraction and ethanol precipitation. Blue / White colony screening is a strategy to quickly and easily distinguish between recombinant and non-recombinant colonies. It requires a special vector and a special strain of E. coli. It is particularly helpful in tricky cloning strategies such as blunt ended cloning or DNA library preparation. The first gene in the E. coli lac operon is lacZ, which encodes ß-galactosidase (ß-gal). The active form of ß-gal is a tetramer and hydrolyses lactose into glucose and galactose. Deleting amino acids 11-41 of ß-gal (called the lacZ?M15 mutation) means the enzyme is unable to form a tetramer and is non-functional (Langley et al. 1975). It was discovered that supplying amino acids 1-59 (the a-peptide) of ß-gal in trans (separately) allowed the truncated ß-gal to form tetramers and function again (Ullmann et al. 1967; Langley et al. 1975). Rescuing ß-gal by supplying the a-peptide in this way was termed a-complementation. Later, Vieira and colleagues (Vieira & Messing 1982) realised that a-complementation could be used to screen E. coli colonies for the presence of inserts. They cloned the a-peptide coding region into a pUC plasmid and then introduced a multiple cloning site (MCS) into the middle of that region. When a piece of DNA is ligated into the MCS, it disrupts the a-peptide, rendering the ß-gal non-functional. 5-bromo-4-chloro-indolyl-ß-D-galactopyranoside (x-gal) is a colourless analogue of lactose. When ß-galactosidase hydrolyses x-gal, it creates a blue product (5,5'-dibromo-4,4'-dichloro-indigo). In blue white screening, an E. coli strain is transformed with a ligation reaction and spread onto agar plates containing x-gal. A blue coloured colony indicates that the a-peptide in the plasmid is intact (no insert) whereas a white colony indicates that the a-peptide is disrupted (insert present). Competent cells of an E. coli strain with the lacZ?M15 mutation. Common Blue white compatible strains include: XL1-Blue, XL2-Blue, DH5a F', DH10B, JM101, JM109 and STBL4. Please see the 'Competent cells' protocol for details about preparing E. coli cells for transformation. A vector with the a-peptide coding region and MCS. Common blue white compatible vectors include: pGEM-T, pBluescript, pUC18 and pUC19 (see button below). Your ligation reaction (i.e. your insert of choice into a blue white compatible vector, above). Antibiotic for selecting for the vector. X-gal 20 mg/ml. X-gal can be purchased ready dissolved or as a powder. It may be dissolved in DMSO or DMF at a concentration of 20 mg/ml. X-gal must be stored at -20°C and protected from light (by wrapping foil around the stock container). Prepare some LB agar plates containing the appropriate antibiotic to select for your chosen plasmid. Please see the 'Making agar plates' and 'Antibiotic concentrations' protocols. and allow the plates to dry with the lid slightly open before use. This can be performed either next to a bunsen burner on the bench or in a laminar flow hood. Using a hood may dry out the plates if they are left for too long. Transform your ligation reaction(s) into competent E. coli cells as usual. Spread the transformation reaction onto an x-gal IPTG plate (prepared as above). Incubate the plate overnight at 37°C. Once the colonies have grown, the plate may be incubated at 4°C for 1 hour. This helps the blue colour to develop making it easier to discern the negative colonies. It is a good idea to include a control. Transform an aliquot of E. coli with an intact a-peptide-containing-plasmid (pUC19 for instance, see button below). The colonies on this control plate should all be blue. If they're not, then the x-gal may not have been spread evenly or the antibiotic may not be working properly. This screen does not give any information about the direction of an insert, just its presence or absence. If the insert is quite short and maintains the frame of the a-peptide, it is possible (but unlikely) that it will produce a functional a-peptide fusion giving blue colonies even when the insert is there (false negatives). However, these colonies will likely be a lighter blue than the true negatives. It is also possible (but again unlikely) to get a white colony with no insert (false positive). This could result from nuclease degradation of the linearised vector disrupting the a-peptide before re-ligation. Therefore, it is always a good idea check your insert by sequencing too. Langley, K.E. et al., 1975. Molecular basis of beta-galactosidase alpha-complementation. Proceedings of the National Academy of Sciences of the United States of America, 72(4), pp.1254–1257. Ullmann, A., Jacob, F. & Monod, J., 1967. Characterization by in vitro complementation of a peptide corresponding to an operator-proximal segment of the beta-galactosidase structural gene of Escherichia coli. Journal of molecular biology, 24(2), pp.339–343. Vieira, J. & Messing, J., 1982. 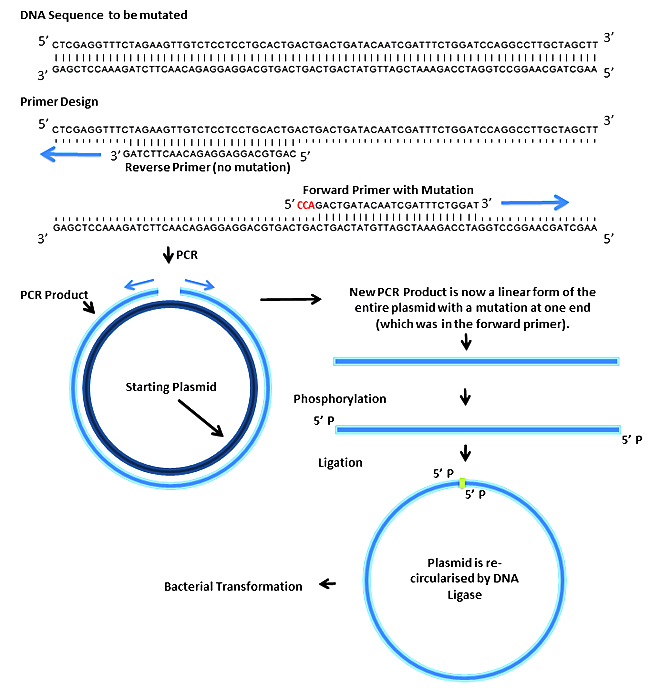 The pUC plasmids, an M13mp7-derived system for insertion mutagenesis and sequencing with synthetic universal primers. Gene, 19(3), pp.259–268. Agarose gels are an easy, cheap and effective method of separating, and viewing, DNA. The agarose concentration of the gel you make is determined by the size of the DNA fragments you intend to resolve, and view. For the majority of DNA work, a gel of 1% agarose is fine and is good for DNA sizes that are between 400bp and 10kb (roughly) and where the two DNA fragments you want to resolve are not of a similar size. If they are similar sizes then you may have to change the concentration. For example, for two fragments of 500 and 700 bp a 2-3% gel would help to separate them. For two fragments that are 10-11kb you would probably need a 0.5% agarose gel, and run it for a long time at a slightly lower voltage (to prevent melting). Gels can be made with either TAE or TBE buffers. There are differences between them that may, or may not, be important to you. See the notes and tips on the buffers page. Add either autoclave tape or electrical tape to the ends of your gel setting tank to hold the gel in whilst setting. Don’t use masking tape as this leaks when wet. Then add your combs so it is ready for pouring. Remember to tape some of the wells of the comb together to make a bigger well if you want to gel extract a DNA fragment (which might mean loading up to 100 µl). Some tanks have rubber stoppers that fit on the end, if this is available it may be less messy than using tape. Weigh the correct amount of agarose into a conical flask or 500ml bottle with a functioning lid and rim (see Tip 1).Most tanks have a recommended gel volume; usually between 40-120 ml. therefore use between 0.4-1.2 grams for the 1% gel. Add the correct amount of buffer to the bottle or flask and mix by swirling. If using a bottle, undo the lid slightly to allow steam to escape. Do not heat with the lid closed. Heat the agarose solution in a microwave until it begins to bubble. Then remove and swirl to mix the solution. It will be very hot so use protective gloves. Microwave until the agarose particles are dissolved. If you swirl the mixture and look at in the light you will see any un-dissolved agarose particles moving around. If using a bottle you can immediately tighten the lid up when you take it from the microwave. Then if you run the bottle under cold water the gel liquid will begin to boil and bubble as it cools. This happens because you cool the air in the bottle which makes a vacuum and allows more efficient heat exchange between the liquid and the gas. Be careful not to cool it too much, you should just be able to hold it comfortably. If using a conical flask then leave it to cool on the bench side until it is just comfortable to hold. Swirl occasionally to ensure the bottom doesn’t set first. Add 1µl of Ethidium Bromide (Potential Hazard: ETBR is a potent carcinogen, wear cloves and dispose of tips and liquid properly) stock per ml of gel. Stock is at a concentration of 500 µg/ml ETBR in water. Final concentration of 0.5 µg/ml i.e. use one 1µl of ETBR stock per ml of gel. For a safer alternative, see note 1. Swirl gently to mix but avoid getting bubbles. Pour the gel from one corner slowly; don’t make it too thick as you might get a lot of auto fluorescence when you image it. You should wait a little while before you use it (approx 40 minutes - 1 hour). It will become opaque when set. The gel starts to set after 15 minutes, and if you are in a hurry, you may then place the gel in a fridge and wait only a further 15 minutes. To run a sample, the gel is placed in an electrophoresis tank containing buffer so that the gel is just immersed (a few millimetres). The DNA will run from negative to positive, so ensure you place it in the correct orientiation. Load a DNA ladder in an adjacent lane. Which one depends on the size ranges of your samples. Run the gel at 10V/cm of gel. Fragments are observed using UV light and a permanent photographic record is made if required. Loading too much DNA can cause problems to separate the bands so try to avoid this is if possible. Tip 1: Many lab bottles have a blue or clear plastic rim which can go missing or get burnt by flaming. These blue rims prevent the liquids running down the bottle when pouring and keep an air tight seal after autoclaving. Make sure the rim is intact. Tip 2: Some companies sell low melt agarose which can help with making the gel. Remember that some gel runs, particularly in TAE, can cause excessive heat. This may damage your gel on extended high voltage runs. Tip 3: Running gels at above 10 volts per gel cm length can cause the gel to melt. Tip 4: Try to make your gel from the buffer you intend to run it in, if not, you may get a conductivity imbalance. Also, old buffers in tanks that have been repeatedly topped up can have a higher salt concentration than a gel made from the same buffer because of evaporation. This can also cause a conductivity imbalance and lead to poor gels. Note 1: Using SYBR Safe DNA Gel Stain is a safer, non-carcinogenic alternative to ethidium bromide. We have not verified its activity. It is often useful to amplify a region of DNA to contain new restriction sites on the ends to allow easier downstream cloning. When designing primers for this purpose it is important to add extra nucleotides to the 5' end of each primer to allow the restriction enzymes to cut the DNA efficiently. Most enzymes like a minimum of three nucleotides but some will require four. It is also important to consider that the melting point (TM) of the primers will vary depending on the stage of the reaction. During the first two rounds of the PCR reaction the primers will only bind the target with a sub-section of the primer, however, once the new DNA (with restriction sites on the ends) has been produced after the first few rounds of the reaction, the primers will bind along their whole length (with a higher TM). Normally, this is not a problem and a single melting point can be used, but if the amplification is inefficient, perhaps start with a lower melting point (that of the section that binds the target DNA) for the first few rounds of the reaction. The basic concept of annealing oligos is to heat two oligonucleotides up such that they denature, then follow this by a period of cooling to allow the two oligos to base pair together. Adding a linker to remove or add a restriction site. Studies requiring small double stranded DNA regions, such as DNA protein binding assays. DNA Phosphorylation status: The cost of purchasing lots of phosphorylated oligos can be prohibitive. For this reason many groups simply ligate oligos into vectors that have not been de-phosphorylated. This is particularly effective when the oligos are to be ligated into a vector that has been cut with two separate restriction enzymes that have incompatible ends (preventing the vector from closing on itself). The background from the ligation may still be high but the oligos are often in significant excess in oligo ligations and so the reaction should still work. It is also possible to phosphorylate the oligos first using polynucleotide kinase (PNK), but cleaning up the oligos is difficult because they are likely not to bind a DNA clean up column because of their sort length. However, PNK reactions are performed in ligase buffer so this may not be necessary, but the PNK must be heat inactivated before the oligo is put into the ligation otherwise the PNK will phosphorylate your vector. Oligo Length: Phosphoramidite chemistry, by which oligos are generally produced, can normally be relied on to produce 40-50 bases without too many mistakes, however, using this technique to produce oligos of 100 bases or longer often leads to mutations. We have frequently found that it is better to divide a long oligo into two shorter oligos with 10-15 base pairs of overlap in the middle on the opposing oligo to allow them to join together. The frequency of mutations you will get following sequencing should be much lower. Cooling Method: We have tried cooling the oligos in a water bath simply by heating it to 95 degrees and then turning it off to cool down, or by heating them to 100 degrees in a beaker on tripod (old school) and then placing the beaker in iced water (and oligos in a tube within the beaker still) to cool. We have also tried placing the oligos in PCR machine set with 5 degree cooling increments every 30 seconds. The reality is that the method does not make a huge amount difference. Leaving them for too long at high temperature could lead to hydrolysis, hence we avoid just turning the water bath off. We generally heat the oligos to 95 degrees in a water bath in a beaker with the tube of oligos in an eppendorf on a float. Then place this in iced water for 10 minutes. This seems to work well for us, but the other methods may also work for you. Overhangs: Designing oligos with overhangs that reconstitute the sites into which the oligo is to be inserted can be difficult. This diagram below provides an example of what the oligos may look like, in this example the oligos are to be ligated NcoI and XbaI restriction sites. Oligo and primer stocks are often resuspended at 100µM (100 picomoles/ul) concentrations. Add 10µL of stock oligos (assuming you have two to anneal) to 25µL nuclease free water into a 1.5ml microtube. Add 5µL restriction digest buffer (such as 100mM NaCl, 50 mM Tris-HCl, 10 mM MgCl2, 1 mM Dithiothreitol, pH 7.9). The presence of the buffer helps to keep the pH correct for DNA stability and the salt should promote annealing. The oligo concentration is now at 20 picomoles/ul. Float the tube in a beaker in water pre-heated to 95 degrees for 5 minutes. Place the beaker into an ice box that is filled with ice and water to allow the beaker to cool for 10 minutes. Once the water in the beaker has cooled dilute the oligos 10-fold and 100-fold in water and add 1µL of this to a standard 20µL ligation reaction. The temptation is to add more but this will just titrate the ligase away from the ends of your vector onto the extra oligos, which can reduce the ligation efficiency. The final concentration of oligos in the ligation would be approximately 2 or 0.2 picomoles/µL. This will still be a significant excess of oligos to vector. You may find that you do not get more colonies on the ligation plate, however, it can still be worth screening a few because of the issue raised in point 6. We often find the reaction has worked even though the plates don’t look as promising as a normal ligation. Precipitating DNA can be hit and miss. Sometimes you end up the same quantity and its more concentrated and cleaner, sometimes you end up with nothing. If you do it right then it should work fine but working with low concentrations of DNA (<20ng/µl) in large volumes can be tricky. Microcentrifuge (Ideally a refrigerated centrifuge or one kept in the cold room). Centrifuge with brake off. Transfer DNA to a container where it occupies less than one quarter of the total volume (For example, a 1.5ml tube should have no more than 375 µL of DNA solution). Add one tenth of the DNA volume of Sodium Acetate buffer to equalize the ion concentrations. Add 2-3 volumes of cold 100% ethanol and place the sample in a -20°C freezer for at least one hour. Centrifuge sample for 15 minutes at highest speed (12-13000 rpm) in a 4°C microcentrifuge. Remove as much of the supernatant as possible with either a 1ml pipette or a glass capillary tube. Be careful not to disturb the pellet. If you get all the liquid out then skip step 6. If not then re-centrifuge briefly, then remove the rest with a 200 µL pipette. Centrifuge for 5 minutes in a 4 °C centrifuge at maximum speed. Remove supernatant with a 200 µL pipette; evaporate remaining ethanol in a 37 °C water bath. Do not do this for too long because overdrying the pellet can make it difficult to resuspend. Tip 1: Performing the precipitation at 4°C is not strictly necessary for it to work but it can increase the efficiency, especially of low concentration samples (<20ng/ µl). Note 1: DNA precipitation can be used to clean a DNA sample, not just concentrate it. It will remove any contaminating salts from the solution. This recipe is designed to make approximately 50-60 plates of Luria-Bertani (LB) agar plates for growing E. Coli with standard plasmids. To watch the video of this protocol click here. Potential Hazard: Powders can be sensitising and you can develop allergies to them. Avoid inhalation of aerosolised powder. Measure out the amounts above and add to a 1 litre bottle with a good working lid (See below). Fill with clean deionised water (ideally at least 18 megaohms). Tighten lid and shake to mix the liquid and powder, don’t expect to dissolve it all but simply to free the powder from the bottom and remove the major clumps. If not mixed properly the powder can bake on the bottom of the bottle. Undo the lid about half a turn; add some autoclave tape and then autoclave. After autoclaving ensure that the lid is done up tight and do not allow to cool below 45-50 degrees. Agar generally sets at about 40 degrees. As a guide if you can hold the bottle comfortably in your hand then it is ready to pour and may actually be too cool already. Don’t add the antibiotic when the agar is too hot, this can affect the antibiotic stability and half life, particularly Ampicillin. Add the correct amount of antibiotic (see below) and mix by gentle swirling. Avoid getting bubbles as this will result in bubbly or uneven plates. Pour about 12-15ml per plate. A simple method is to stack the plates up with the large sections (lids) upright. Lift the entire stack up using the lid of the bottom plate and using your other hand pour in the agar. Pour enough to fill the bottom and then a little bit more. Then put the stack back down and lift again with the next lid in the stack. Sounds inconsistent but with time this is very reproducible. Tip 1: Many lab bottles have a blue or clear plastic rim which can go missing or get burnt by flaming. These blue rims prevent the agar running down the bottle when pouring the plates and keep an air tight seal after autoclaving. Make sure the rim is intact. Tip 2: 1 litre is quite a lot of agar and antibiotic, scale down the recipe to suit your needs. I generally make 0.5 litres at a time ( about 30 Plates). Note 2: Pre-mixed LB powders are available from many suppliers and don’t actually work out much more, if any, expensive. Lysozyme at 10mg/ml in water. Ribonuclease A solution at 20 mg/ml in distilled water and stored in 50µl aliquots in -20°C. Potential Hazard: Phenol is very dangerous and causes skin burns immediately on contact. It is toxic on contact, by inhalation and by consumption. Burns should be treated immediately with 20% Poly Ethylene Glycol (PEG) 300 or 600 water solution. Read the protocol before starting and make sure you have all the stock solutions ready. The lysozyme solution is usually made during the centrifugation period. The rest has to be ready before you start. Make a pre-culture of 3 ml LB media first thing in the morning by picking a single colony from a fresh agar plate (ideally streaked the night before). After 3 hours the pre-culture should be slightly turbid, inoculate 800ml LB media pre-warmed to 37°C (500-fold dilution) and grow overnight (24 hours). Shorter incubations may cause problems with excess proteins and RNA in the cell lysate. Centrifuge the culture using the available infrastructure (for example 60 minutes, 3699rpm) and remove the supernatant carefully. 250ml polypropylene conical bottomed tubes work well. The supernatant will still contain E.coli so do not tip it straight down the sink. Put the tubes containing the cell pellets on ice and resuspend pellets in 8 ml of icecold TE 50/1 (see above). Pellets must be completely resuspended by occasional vortexing and placing back on ice, takes some time (5 minutes). Transfer the cell suspension with a 10ml pipette into clean SS34 50ml tubes that are standing on ice already. All further manipulations will be done on ice! This is a good point to take a break if required. Quickly add 2.5 ml of freshly made lysozyme solution (10mg/ml) to all tubes, close the tubes and turn them quickly upside down and back at least 10 times (preferentially all tubes at once. The suspension should become slightly viscous. Do not shake the tubes, just turn them. Shaking will sheer the genomic DNA and it will contaminate your plasmid DNA. Incubate for 5 minutes on ice. Unscrew the bottles and from now on remember which cap belongs to which tube (very important because the solution is viscous and a significant portion will stick to the cap). Quickly add 2.0 ml of 0.5M EDTA pH 8.0, close the tube and turn them again as before. Again, do not shake them vigorously! Suspension will become more viscous. Incubate another 5 minutes on ice. Mix 50µl of Ribonuclease A solution (see above) with 150µl Triton X-100 10% solution and make up to 1ml with TE 50/1. Add this mixture to the tubes. Then close the tubes and turn them as before (no shaking). Suspension will become even more viscous. Incubate 30 minutes on ice, without ever touching them again. The idea is to let the detergent do the rest of the cell lysis in a very gentle way, on ice. Centrifuge at 18,000 rpm in a Sorvall SS34 rotor or similar for 60 minutes. You should get a nice pellet, but sometimes the pellet can be big with very little supernatant. This usually happens when your bacterial culture is too young. In this case, repeat the centrifugation, it should help. Transfer the clear supernatant to a clean Falcon tube. Now it is possible to interrupt the procedure for longer periods by freezing the recovered supernatants at -20°C. It is also possible to have a lunch break and keep the supernatant on ice. Add 20 ml of equilibrated phenol (see above) and shake vigorously for 1 minute, spin down at maximum speed in the swing out rotor for 20 minutes. Slowly recover the water phase (upper) and make sure you leave the interphase in the tube. Transfer the upper phase to a new tube and add 20ml of chloroform, shake again as before and spin as before for 5 minutes. Slowly recover the water phase (this time it is easier to avoid the interphase), transfer to a 30ml Corex tube (between 10 and 15ml, the volumes need to be equalised by the addition of TE 50/1), add 1ml 5M NaClO4 (10% of the water volume), mix and add 8ml isopropanol (80% of the water volume). Seal the tube with parafilm, and turn it around a few times to mix everything. Then spin down in HB4 rotor at 10,000rpm for 15 minutes. Discard the supernatant, dry the pellet by leaving the lid open on the bench or at 37°C. Re-suspend in 500 µl of TE and transfer to a sterile eppendorf tube. Avoid over drying the pellet. Store at 4°C. You will need to check the DNA on gel to assess the quantity of RNA , it is usually necessary to carry out a second RNase treatment at this point. Potential Hazard: Chloroform is toxic by inhalation, oral consumption and skin contact. Wear gloves and use a fume hood. If skin is contacted then wash immediately with plenty of water. Dilute the maxiprep to 5ml with TE in a 50ml Falcon tube. Add 5ml phenol, and shake vigorously for 1 minute, spin down at maximum speed in the swing out rotor for 15 minutes. Slowly recover the water phase (upper) and make sure you leave the interphase in the tube. Transfer to a new tube and add 5ml of chloroform, shake again as before and spin as before for 5 minutes. Slowly recover the water phase (this time it is easier to avoid the interphase), transfer to a 15ml Corex tube (approx 5ml), add 500µl 5M NaClO4 (10% of the water volume), mix and add 4ml isopropanol (80% of the water volume). Seal the tube with parafilm, and turn it around a few times to mix everything. Then spin down in HB4 rotor at 10,000rpm for 15 minutes. Discard the supernatant, dry the pellet, resuspend in 500 µl of TE (10mM Tris-HCl pH 8.0; 0.1 mM EDTA pH 8.0) and transfer to a sterile eppendorf tube. Store at 4°C. Check the DNA on an agarose gel to make sure most of the RNA is gone. Determine the DNA concentration and purity spectrophotometrically (a nanodrop is a useful tool at this point). Inoue and colleagues developed this method in 1990. It works well for many strains commonly used in cloning. The original method calls for growing the overnight E. coli cultures at 18°C. We find that it still works well if they are grown overnight at 37°C. Sterilize the buffer by passing it through a 0.22 µm or 0.45 µm syringe filter. *The MgCl2 must be added after autoclaving from a 1 M stock. Pick a single E. coli colony from an LB plate that has been incubated overnight. Inoculate a starter culture of 2 ml of SOB medium in a 50 ml tube with the colony and incubate it for approximately 7 hours at 37oC with shaking. Prepare or thaw out an aliquot of the Inoue transformation buffer. Inoculate three flasks containing 250ml SOB medium with three different volumes of the starter culture to ensure that one of them reaches the desired OD the following morning. We suggest trying, 10 µl, 50 µl and 250 µl. Incubate the flasks overnight at 37°C with shaking. The next morning read the OD600 of all three cultures. Continue to monitor the OD600. Harvest the cells by centrifugation for 10 min at 2,500 x g and 4°C. Pour away the supernatant and re-suspend the cells gently by pipetting in 80 ml ice-cold Inoue transformation buffer. Recover the cells by centrifugation for 10 min at 2,500 x g and 4°C. Pour away the supernatant and re-suspend the cells gently by pipetting in 10 ml ice-cold Inoue transformation buffer. Add 0.75 ml of DMSO, mix by swirling, and store the cells on ice for 10 minutes. Dispense 100 µl aliquots of cell suspension into chilled microfuge tubes. Snap-freeze the aliquots of competent cells in batches by dropping them into liquid nitrogen. Store the aliquots in a -80°C freezer until needed. Site directed mutagenesis (SDM) is a useful technique for introducing a specific mutation into a plasmid at a specific site. The mutation can be a substitution, insertion or deletion. There are many applications for SDM, for instance to assess the function of certain amino acids in an enzyme, to investigate the effect of altering bases in a promoter or removing restriction sites from a plasmid. 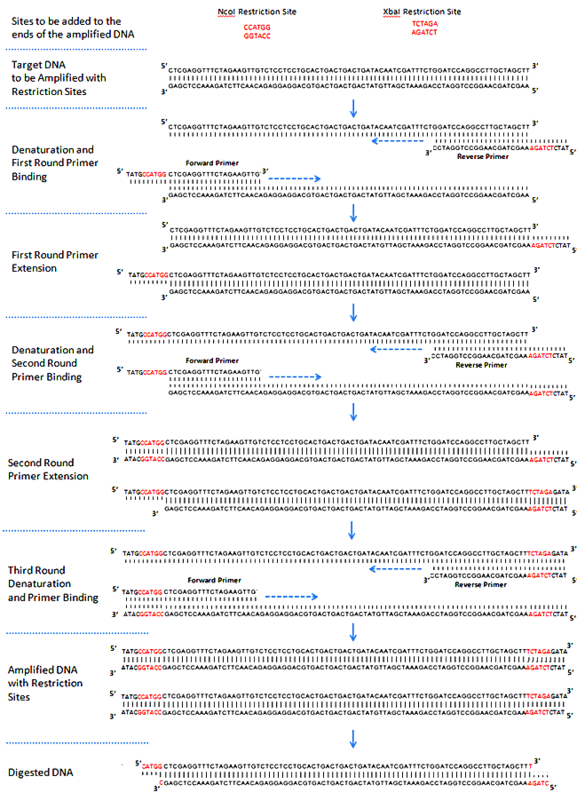 Here we describe a PCR based site directed mutagenesis method. The basic principle is to design a pair of PCR primers back to back, so that the entire plasmid is amplified by PCR. One of these primers incorporates the desired mutation. The PCR creates a linear product whose ends can then be joined together (after phosphorylation) with DNA ligase. The circularised vector is transformed into E. coli. Design a pair of primers incorporating your desired mutation into the 5' end of one of them. Design them so that the complementary region has a Tm of around 60 degrees C.
Note that only the forward primer contains the mutation, so you could easily make a series of different mutations by keeping the rev primer the same but using different forward primers. The above example is a 3 bp substitution but an insertion can be made in the same way. If you require a very large substitution or insertion, then mutant bases may be introduced at the 5' end of both primers. Deletions of any size can be made by spacing the forward and reverse primers apart on the template. It is important to use a proofreading polymerase to avoid introducing any other mutations. That said, if you were still worried about introducing mutations you could sub-clone the mutated fragment back into the same backbone after the mutagenesis. Set the reaction up on ice, and transfer the tube to a pre-heated PCR block straight after mixing the reaction. Run the entire reaction on an agarose gel. Excise the band and clean up the DNA using a gel extraction kit, eluting it in 30µl. *This step can be omitted if you used phosphorylated oligos in the PCR. Incubate at 37°C for 40 mins. *Ligase buffer is used because it already contains ATP and PNK is active in it. Set the ligation reaction up on ice. Incubate at 16°C overnight or at room temperature for 2 hours.